History: (Fantastic Four I#377)- As the Human Torch went to trial for setting fire to Empire State University, he was attacked in the courtroom by his enemies Paibok and Devos, who had earlier fought him at ESU. Simultaneously, Klaw attempted to have his revenge upon the Fantastic Four by manipulating Huntara of Elsewhen into siding with him against the Fantastic Four. Finding they had similiar motives, the four villains pooled their resources to attack the Fantastic Four. (Fantastic Four I#378)- As the villains entered into battle against the Fantastic Four, they found themselves having to also contend with the FF's friends, Spider-Man, Sandman, Silver Sable and Daredevil. Even against superior numbers, the four villains fared well against the heroes, but when the Avengers arrived, they decided to retreat through a portal opened by Huntara. Daredevil attempted to pursue, but the dimension in which he found himself confused his senses, and he had to be pulled out by Spider-Man. (Fantastic Four I#379)- The villains met aboard Paibok's starship as Paibok informed them that he had a plan to destroy the Fantastic Four. (Fantastic Four I#382)- While the Fantastic Four were away in Latveria, Huntara teleported herself and her allies into Four Freedoms Plaza, where they lay in wait for the Fantastic Four's return. When the heroes returned, Huntara launched into battle with Psi-Lord, leading the two of them away from the others. The remaining members of the Fantastic Four were taken out by knock-out gas delivered by Devos and Paibok. 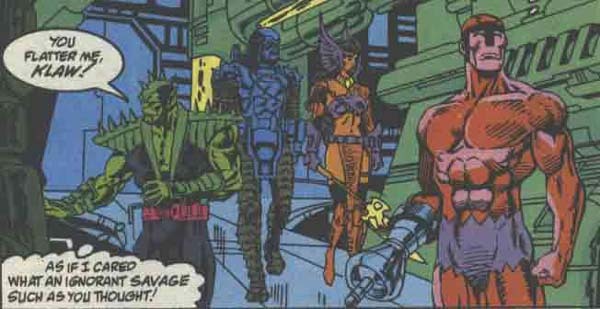 The two allies then teleported their captives to Paibok's ship, so that they could turn them over to the Skrull Empire. After they had disappeared, Klaw came out of hiding, and took the unconscious body of Ms. Marvel prisoner. Comments: Created by Paul Ryan, Tom DeFalco and Dan Bulanadi. The Fearsome Foursome were only named as such on the cover of Fantastic Four I#378. Klaw subsequently teamed up with Ms. Marvel in a new Frightful Four in Fantastic Four Unlimited#5.